Over the past two decades, the way we learn has changed dramatically. We have new sources of information and new ways to exchange and to interact with information. But our schools and the way we teach have remained largely the same for years, even centuries. What happens to traditional educational institutions when learning also takes place on a vast range of Internet sites, from Pokemon Web pages to Wikipedia? This report investigates how traditional learning institutions can become as innovative, flexible, robust, and collaborative as the best social networking sites. The authors propose an alternative definition of “institution” as a “mobilizing network”—emphasizing its flexibility, the permeability of its boundaries, its interactive productivity, and its potential as a catalyst for change—and explore the implications for higher education. The Future of Thinking reports on innovative, virtual institutions. It also uses the idea of a virtual institution both as part of its subject matter and as part of its process: the first draft was hosted on a Web site for collaborative feedback and writing. The authors use this experiment in participatory writing as a test case for virtual institutions, learning institutions, and a new form of collaborative authorship. The finished version is still posted and open for comment. 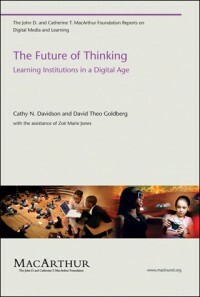 This book is the full-length report of the project, which was summarized in an earlier MacArthur volume, The Future of Learning Institutions in a Digital Age.